On Saturday, April 14th, The Orange Mountain Bike Club (OMC) hosted a ride day in honour of Dr Steve Peterson. Earlier this year, Steve was hit by a car while he was riding to his shift at the Orange Health Service. He was flown to the Royal North Shore Hospital where he is being treated for major spinal trauma at the C4 vertebrae as well as other serious injuries. Steve is now in a stable condition but has a long road to recovery. Steve and his wife Debby are both loved community members of Orange and have been heavily involved in the Orange Evangelical Church, the Orange Mountain Bike Club and other local community health programs. Steve used to often volunteer his medical skills and help patch up injured riders. 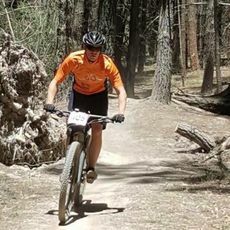 The mountain biking community rallied together to support their friend on Saturday, running a 12-hour event at the Mount Canobolas trails. Over 70 riders participated in the event, which was initially organised to provide Dr Peterson’s family money to help with the costs of accommodation and transport to and from Sydney. However, Orange Mountain Bike Club president Jack Rahilly said the family and Dr Peterson requested the money go towards research to help all people affected by spinal injuries. The event was an immense success and over $12,000 was raised for research! Thank you to everyone who participated in and donated to OMC Rides For Dr Steve Peterson fundraiser. Thank you to The Peterson family for choosing to donate to spinal cord injury research. We are immensely grateful to everyone involved for supporting our quest for a cure for spinal cord injuries. Through your support, we are one step closer to helping people like Dr Steve Peterson get back on their feet.